Nora is 1/2 of a farming sister duo and a next generation farmer coming into her own. As she navigates what and who she wants to be on her family farm, she shares a lot of responsibilities. Of those many things, the one she does most passionately is making bread. Last year the sisters set a goal to construct a mud oven by hand to accommodate larger orders of boules. This summer they completed it. This summer Swampy Vale contributed flower bunches, bread, fennel, agretti, sorrel, and more to Coeur et Sol’s weekly farmer’s market offerings and summer CSA. When Nora and her sister Megan of told us they were going to be transitioning their family farm to grow small grains, flowers, and veggies we couldn’t wait to work with them. With the new addition of their mud oven, we’re so excited to be able to bring our neighbors goods from Swampy Vale year round. 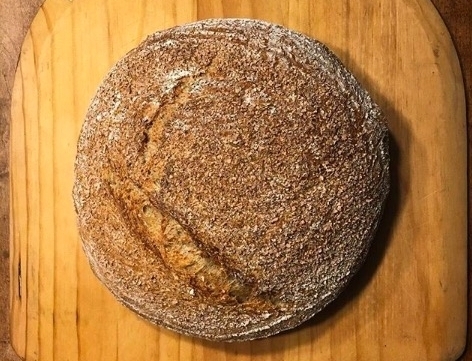 Currently grains are sourced from Living Lands LLC grown by farmer Tom Hlansey. All breads are made using Swampy Vale Farm well water and use salt sourced from the Pacific Northwest. Each dough is fermented at the Swampy Vale homestead and uses simple ingredients. Take their white bread, for example, which uses a blend of white and whole wheat flowers, salt, and yeast. Mixed with a passion for fresh food, each loaf is perfect for your next sandwich. Three generations have tended the land at Swampy Vale Farm in Pittstown, NJ bringing high quality produce and grains to the state for decades.